“Ask Omegawave” is an educational series during which we will be engaging in informal Q&A sessions with members of Omegawave’s science team, including Co-founder Val Nasedkin and our Senior Research Scientist Roman Fomin. Question: What measures (or combinations of parameters) go into the calculation for each individual Window of Trainability? Val Nasedkin: It seems people think that different methods are responsible for different Windows, but that is not true. All of the measurements are part of all of the Windows. It’s a proportion of the changes in those individual methods and their relation to each other that will determine which Window will be open or closed—but all of our methods are responsible for all the Windows. Q: How did we determine the proportional relationship between physiological parameters to hone in on the proper “framing” for each Window? VN: For that we need to go to our original “Expert System,” because our Expert System already gave us a starting point. It validated volumes and intensities of work. On top of that, we applied our own knowledge of coaching and science and looked at the parameters and interpreted how we as coaches would take this data and convert it into solutions. Our system is not purely numeric, it also incorporates our knowledge as scientists and coaches. So our Expert System that now derives Windows of Trainability is programmed with our knowledge as a function—it’s our informed opinion of how training should be adjusted based on the raw numbers that we as specialists have analyzed. Q: Since the individual response to stressors is highly variable, how do we know that the day you decide to modify your training to a partially closed window (reducing volume and/or intensity), you will get a better training benefit than if you pushed through with a scheduled hard training? VN: We need to start from the beginning—norms. Let’s start with biological norms. A biological norm is a norm is a norm. We know exactly what the temperature is in your body—between 36 and 37 degrees Celsius, that is the norm. In this norm you can do whatever that you do. If it’s below or above, than the amount of activity that you do should be limited. The norms in our Expert System are the same—it’s an established biological norm. Any fluctuation from that biological norm should affect peoples’ ability to fulfill their goals in physical activity. But, we are not claiming that they all should have the same load—that’s now a methodological norm. That’s why our terminology is very specific—we don’t tell you how many runs to do or what distance to do them. What we are telling you is that your Window is open for your individual maximum. Roman Fomin: Basically, we are talking about limitations. We don’t know a lot about a [hypothetical] athlete, but we know exactly what is bad for them. When we show a green, fully open window, that means there are no limitations. There are no significant issues in their cardiovascular system, their autonomic nervous system, their central nervous system, everything looks good. This athlete’s body will be able to get the maximum benefit from training. As soon as we are seeing some issues, or when we are seeing limitations, we show yellow because based on our knowledge about limitations, we know the body is unable to perform at a maximum level with a maximum volume and intensity and receive a maximum training load. It will lead to negative consequences. Q: On the most basic level, someone may think if I wake up in the morning and I do 100 pushups, that’s automatically better than doing 80 pushups. Whether I feel great or feel lousy, 100 is better than 80. So, to explain why 80 may in fact be better than 100 on certain days, how do we know that on those days you’re yellow, you will get a better training effect from reducing volume or intensity? VN: We have two types of standards—biological and methodological. An open Window means you fill a perfect biological standard. But, when you don’t fill a perfect biological standard, then another standard comes in—my opinion as a coach. So if you are not in an optimal state, as a coach I will make a decision – do I decrease your intensity by eighty percent? Sixty percent? So, our Windows take into consideration not only biological norms, they also take methodological norms. For example, let’s look at the Window for Speed & Power. I know when your central nervous system is diminished or your autonomic system is unbalanced or you have muscular fatigue, then your ability to perform activities above 95-98% of your maximum are limited. Therefore, as a coach, I apply my next standard—methodological. Based on your biological state, I believe that I should decrease the intensity of this work, at least below 90%. That’s how our Expert System works. Looking at our Skill windows, those operate by different principles but they are also based on methodological knowledge. We understand the learning capabilities a human being has while in different physical conditions, and we apply the same principles. First, we look at biological norms, and if they are perfect—everything within the norm—there are no limitations. We don’t need to apply our methodological knowledge. But if the biological measures are outside the norm, that’s when the second stage comes—our knowledge of how to adjust methodologically their type of activities. As I said, it’s always a two-step program—and, again, when it comes to methodological conclusions, much of it is our opinion. RF: Why do we need any physiological, biochemical, or any data? Because we are working with an athlete who is a biological system. And this system has to be… we have to control the processes inside. This is our target, to create adaptations which will lead to better results, right? Therefore, as a biological system, this system works according to physiological and biological laws. And we have to follow these laws. We can’t ignore them, or just break them. We have to follow them. At Omegawave, our system provides the physiological feedback and information about the current status of this system, constantly. The next step is to make a decision based on this information. As Val said, the next step is to use the methodological piece—what should I do based on this information from this biological system? Like with your car, you read the gauges on your dashboard and you can make a decision. You look on the indicators and see the oil is very low—now you make a decision: if it’s empty or close to it, I have to go to a body shop and change the oil. This is how you communicate with this system. With the human body, it’s the same. Based on the physiological data, coaches can make better decisions on what they should do in the training process, how to adjust it, because they can’t say hey, let’s cancel training because this guy has very poor functional state. Coaches know everything that happened yesterday, the day before yesterday, and so on, and based on their expertise and knowledge of all the components of a comprehensive training process, they can make better decisions and say, okay, maybe I will reduce or change this particular training session. Basically, we are talking about better decision-making, based on these channels of physiological information. 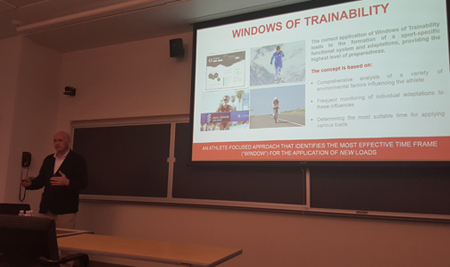 Q: If an athlete’s Window is only partially open in a quality like Speed & Power or Coordination & Skill, in order to raise that into the green, is there any way from Windows of Trainability to know if what that athlete might need is more stimulation in that quality versus more rest & recovery? RF: Let’s use another simplification. We have a lot of signs out on the roads, and they provide different information, correct? Say, a sign that says “Road Construction Ahead.” You see that sign and you know to reduce speed, be a little more careful, etc. Our system is close to the same principle—we provide signs that show your cardiac system may be a limitation, or your brain activity may be a limitation. But we don’t know why. We can’t evaluate all the factors: lifestyle, training, all sorts of contributing factors. We just know there is some issue there, and based on that, the coach or athlete can make better decisions. VN: That’s a very good point that Roman makes. Very often, we don’t know why this Window is shut down. What we do know—based on the information about the functional state—is that work of a certain volume and intensity is not going to be successful. But we don’t know why they are where they are at. That’s why we can’t give them an exact solution: do they need active recovery or more sleep? We don’t know. But they should be able to recognize the different reasons why this window is shut down, and then respond accordingly. And the best way to support that process is education, education, education.